Sclerotherapy uses injections from a small needle to improve the cosmetic appearance of spider veins. It is also used to treat small varicose veins in the legs, and relieve related symptoms of varicose veins such as aching, burning, swelling and cramping. Each treatment session results in a 50-80% elimination of the treated veins. Inform your doctor if there is a possibility you may be pregnant and discuss recent health issues, medical conditions, allergies and medications you’re currently taking, including herbal supplements and aspirin. You may be advised to stop taking any blood thinners, nonsteroidal anti-inflammatory drugs (NSAIDs), iron supplements, or aspirin for several days before your procedure. Do not apply any lotions to your legs before or after the procedure. Wear loose-fitting clothing and refrain from wearing any jewelry. Sclerotherapy is a minimally invasive procedure used to treat varicose and spider veins. The procedure involves the injection of a vein-dissolving solution directly into the affected veins, causing them to shrink and eventually disappear. Sclerotherapy is used to improve the appearance of spider veins and to relieve some of the symptoms associated with spider and varicose veins, including aching, burning, and swelling. It is the primary treatment for small varicose veins in the legs and it is our most popular vein treatment option overall. You should discuss any and all medications that you are currently taking, including herbal supplements, with your doctor. Inform the doctor if you have allergies, especially to local anesthetic, general anesthesia or to contrast materials containing iodine (sometimes referred to as “dye” or “x-ray dye”). Your doctor may advise you to stop taking aspirin, nonsteroidal anti-inflammatory drugs (NSAIDs) or blood thinners for a specified period before your procedure. You may be asked to stop any iron supplements. Discuss any recent illnesses or other medical conditions you may have with your doctor. Ask your doctor about any antibiotic medications you may be taking or ask for safe guidelines for discontinuing these medications. Do not apply any lotions to your legs before or after the procedure. Be sure to wear comfortable, loose-fitting clothing to your exam. You will also want to bring a pair of shorts. What equipment is used for the procedure? The procedure uses a small, thin needle to inject a sterile sclerosing solution into the small veins. 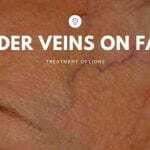 The vein-dissolving sclerosant solution is injected directly into the spider or varicose vein, irritating the lining of the vein, causes it to swell and close. Over time, the vein becomes scar tissue that fades from view and dissolves into the body. Sclerotherapy is an outpatient procedure. In some cases, patients may require admission. Please consult with your doctor as to whether or not you will be admitted. With a small needle, your specialist will inject the vein-dissolving solution into the vein. As the treatment continues, you will feel small needle pokes and possibly a mild burning sensation. The number of veins treated in each session varies and depends on the size and location of the veins. The treatment is typically completed within 30 to 45 minutes. Should I expect any pain during the procedure? You may feel a cramping sensation for one to two minutes when larger varicose veins are injected with the solution. After the procedure, the doctor will instruct you to wear compression stockings or support hose to “compress” the treated vessels. You may experience specific side effects after your treatment. Larger treated varicose and spider veins may bulge and become hard for several months before disappearing. Red raised inflammation may appear around the injection sites and should go away within a few days. Brown lines or discoloration of the skin may be visible at the injection sites. In most cases, they go away within 3-6 months but can be permanent in about five percent of patients. Bruising may occur around the injection site and usually will only about a week or so. Generally, spider veins respond to sclerotherapy treatments in three to six weeks, and larger spider and varicose veins respond in 3-4 months. If the veins respond properly to the treatment, they will not reappear. New veins may appear over later on, and if needed, you may return for additional treatment. How will I know if the procedure was a success? The interventional radiologist or doctor will advise you as to whether the procedure was a success when it is completed. Your doctor may recommend a follow-up after your procedure or treatment is complete. The follow-up visit may include a physical, imaging procedure(s) and blood or other lab tests. During your follow-up visit, you can discuss with your doctor any changes or side effects you have experienced since your procedure. What are risks and benefits? Each sclerotherapy session will normally result in a 50 to 80 percent elimination of the injected veins. As with any incision to the skin, there is a risk of skin infection. The chances of infection that require antibiotic treatment is less than one in 1,000. Risks include the possible formation of blood clots, severe inflammation, adverse allergic reactions to the sclerosing solution and injury to the skin that could leave a small but permanent scar. What are some limitations of Sclerotherapy treatment? Large varicose veins normally do not respond as well as small ones to sclerotherapy. A small number of people (less than ten percent) do not respond to sclerotherapy injections. In these instances, different solutions or methods, such as cutaneous laser therapy, may be recommended. If you are pregnant or breastfeeding you will not be able to undergo sclerotherapy treatment. You will be required to wait at least three months after giving birth before you can be considered for this treatment. Often, ambulatory phlebectomy is used with a more comprehensive treatment plan, including additional procedures such as endovenous catheter ablation that uses radiofrequency or laser energy. St. Johns Vein Center uses radiofrequency ablation. Patients should discuss their customized treatment plan with their interventional radiologist.